The holiday season is here and that means many things. It means time to spend with family, time to admire (and create) beautiful decorations and, of course, delicious holiday treats! Every year we love to make holiday sugar cookies. It is a bit of a process to make the cookies and then even more of a process to decorate them, but it IS really fun. We usually wait until close to Christmas to make the cookies, but we get the urge to eat sugar cookies much earlier! To satisfy that sugar cookie flavor hankering, we have something brand new to try. 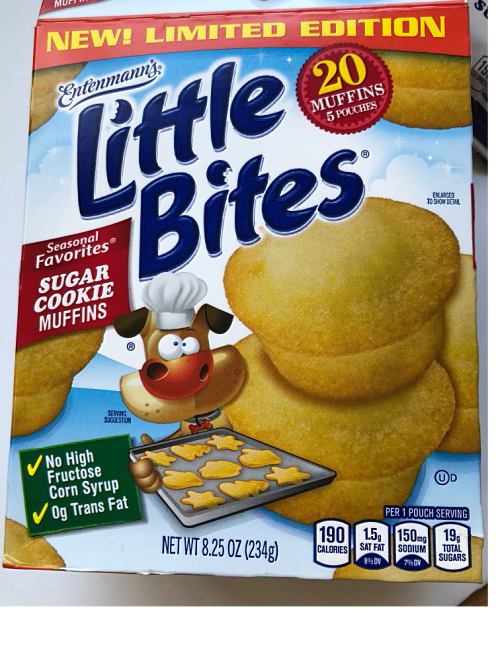 Entenmann’s® Little Bites® Sugar Cookie Muffins! 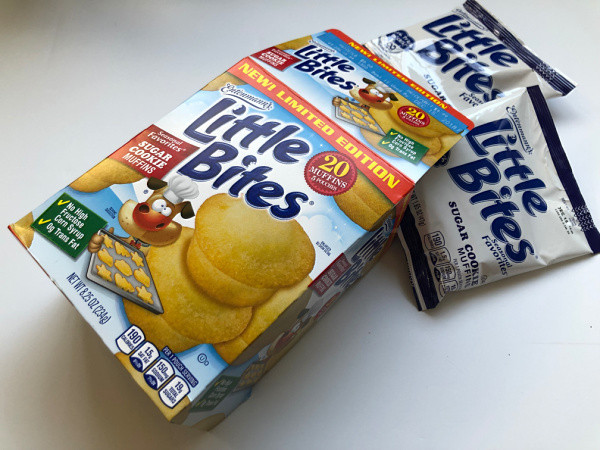 Entenmann’s® Little Bites® are the perfect pre-portioned pouches of delicious baked snacks made with real ingredients and never contain no high fructose corn syrup or trans fat. 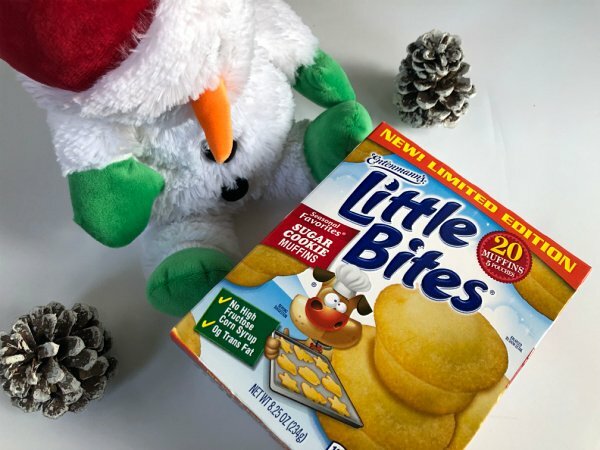 New Entenmann’s® Little Bites® Sugar Cookie Muffins are a yummy seasonal variety available especially for the holiday season! They bring the classic taste of a holiday sugar cookie into a new mini muffin form. My husband is the biggest fan of the new Little Bites Sugar Cookie Muffins and has requested them for his packed lunches at work. The bonus is that they are perfectly portioned with only 190 calories per pouch. The other fun thing about those little pouches is that they are just the right size to stick in a Christmas stocking or tuck into a holiday care package. I can think of lots of ways to use them throughout the season. We’re all happy that we have a fun and easy way to enjoy the flavor of sugar cookies all season long. At home for snacks, at work, at school – you name it, these Entenmann’s® Little Bites® Sugar Cookie Muffins are ready to go. One lucky Thrifty Jinxy reader will receive a $25 virtual Visa gift card and (2) coupons for $5.00 off the purchase of any Entenmann’s® Little Bites®! To enter, just complete the entry form below by 11:59pm ET 12/12/18. Good luck! My kids love them as after school snacks as they wait for dinner. I think my kids would like the sugar cookie muffins. They sound delicious. These are wonderful snacks for when we travel during the Holidays to relative homes. I don’t have kids, but I love the Strawberry Yogurt Muffins. while waiting for the turkey to be done. I want to snack on the chocolate donuts. Love Entenmann’s muffins on Christmas morning. The 2 weeks before Christmas, leading up to the big day as we listen to Christmas carols. In the evening, with some iced coffee. This is all my daughters eat, they love them! He would love an afternoon snack. We most like to enjoy Entenmann’s Little Bites at Christmas, in front of the fire. Me and my kids would love to snack on these while watching Christmas movies. They would be great for an after dinner snack. We would snack on Little Bites on the weekends for breakfast during the holiday season! What a great Christmas mid morning treat for myself and our grand kids; Entenmann’s Little Bite muffins with tall glasses of frosty cold milk. Christmas morning while opening gifts. Thanks for the chance to win. We would like to snack on these after dinner. They like to eat them for breakfast. We love enjoying Entenmanns while watching Christmas movies! I would enjoy them the most with my morning coffee. We are most likely to snack on Entenmann’s Little Bites during the holiday season while wrapping gifts. We like to snack on Little Bites as an afternoon snack, usually after school. We would most like to snack on these while waiting at the airport during inevitable delays! We eat them as after school snacks and on our weekly picnics. 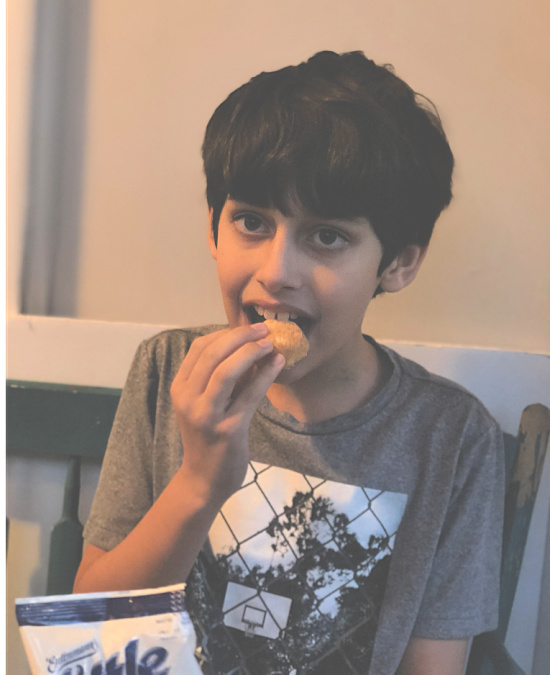 “Let us know when you or your kids would most like to snack on Entenmann’s Little Bites® during the holiday season.” At nine o’clock in the evening after a festive holiday meal, with the adults drinking champagne and the kids drinking healthful, life-giving ginger ale! We would love to snack on Little Bites while driving around town looking at Christmas lights! My kids love to snack on the for a quick breakfast or afternoon snack. we like to eat them on christmas morning! yummy! My son would most like to snack on Little Bites after school. My grandsons love to eat these Little Bites muffins in the morning with breakfast! In-between decorating the house or when being with family or friends to relax together. We would snack on them after my son gets home from school. WE like these for breakfast or an afternoon snack. Mine love the blueberry muffins. These are great for when we are traveling! We would snack on the Entenmanns during our car rides to visit family. We will snack on Entenmann’s Bites while we are decorating the tree. We like to snack on Little Bites in the afternoon during the holiday season. We love these for on the go racing around during the holidays. Little Bites are a great snack on the go during this busy season! Thank you for the chance to win! Our little one loves to snack on these when he gets home from school! They would be a great afternoon snack. We would snack on these after our snowball fight! My twins would be snacking as soon as their on Christmas break! Our kids take them to school, so that is when they would most likely eat them. Though, for all I know, they trade them at school for other things. I remember when I was a kid we traded snacks like currency. I would snack on them when I am on the go. I would snack on them when I’m running out of my house. Same with my kids. I hand them a package and there is never a complaint. Late morning or early afternoon is the time that we usually enjoy our Entenmann’s.. They would most likely have them as a mid-morning snack. The kids would most like to snack on little bites this holiday season on Christmas morning while opening the presents. My son would snack on these when he is out on holiday break. My kindergartener takes little bites with them for snack every day at school. I like to snack while watching Jeopardy. I would love to snack on them any time! In the evening when we are watching tv. I like them with coffee for an afternoon snack. We always like to snack while curled up watching a Christmas movie, sipping on Hot Chocolate! My kids would like to snack while watching all the classic holiday movies and cartoons. We’d love to snack on them after lunch! My kids and I love to snack after school. My kids would eat them for an after school snack. Honestly, we all snack on Little Bites, mostly when my nephews come in from school. I’m as likely to eat the Little Bites as they are, lol. They’d be good to have as we are running around shopping during the holiday weekends. So much better than the hunger anger that can show up. My daughter likes to pack Little Bites in her lunch. We also enjoy them at home as a snack. WE like to snack on them when we are on the go! My kids would snack on them after school or while watching Christmas movies. They would be handy during traveling! We love snacking on these on road trips to family for holidays and lunch time. We love to snack on them in the morning. anytime is a great time for Entenmanns snacks! They would love to snack on these anytime. They would be a nice snack after decorating the tree. We would snack on them whenever we need a sweet treat. these are good for brekkie on the run. They are delicious and easy to eat on the go. I love snacking on them for dessert after lunch or dinner. When do my kids NOT like to snack? LOL. They would eat these any time. I have two teenage boys and they are always hungry. We like to snack during the long car trips to visit family in the holiday season. They make a great afternoon snack. While watching Rudolph with all of us piled on the couch together. They are usually consumed in the car on long rides..
We like the blueberry muffins. We also like the brownie bites. These are good to snack on with a mug of hot chocolate with marshmallows. Snack at night is perfect with little bites. My kids love to snack on these after school or after sports. Snacking is fun in the afternoon when everyone is hungry & tired. Yum! We would love to snack on them ANYTIME! Thank you for the chance! We’d bring them along to snack on during shopping trips. My kids like to snack on these right after school! Anytime that I want a snack.Especially after lunch or dinner. My kids love Little Bites! We usually get the chocolate chip variety. I keep a pack in the car for an afternoon snack because we have a long commute. My granddaughter likes them for breakfast. We would snack on them while running errands in the car. These are great to snack on while watching a movie. My daughter loves them as a snack in her lunchbox..
As a snack after lunch or dinner! The kids would snack after school. They are good to snack on anytime. I like to have Little Bites as a snack when I’m on the go. I think my kids kids would most like to snack on Entenmann’s Little Bites mid morning for a snack after school lets out for the holidays soon. We’d love these after school. These are wonderful snacks for when we travel, after school snacks and breakfast. We like to have them for breakfast heading out the door. My kids just love theses any time of the day. We would like them anytime but mostly for an afternoon snack. My sons eat The Brownie Bites as a mid-afternoon snack. We love to snack on Entemann’s anytime. Very addictive. My favorite time is a midday energy boost or a stocking stuffer. My kids would eat them for their after school snack. We love snacking on Entenmanns after school!!! In the evening, with hot chocolate, as a treat! The blueberry flavor of Entenmann’s Little Bites is by far my whole family’s getaway to enjoy pass-time near our lunchtime. When we are watching Christmas stories before bed. Its a nice snack. The kids I nanny eat them almost every day after school. My kids most like these with breakfast! My kids love to snack on Little bites after school each day. It is getting to be a tradition! Our children would eat these at any time of the day. My daughter seems to enjoy them most after school! We are on the go a lot around the Holidays, so they would be a nice snack for car rides. We would enjoy them as an afternoon snack. They’re a great afternoon snack! Love to eat them after work for a snack! They would love to snack on them during a movie. My son would eat these in the mornings on the way to school or in his lunch box! My kids would eat them for breakfast. This would be a great snack for my kids between lunch and dinner! My girls like the chocolate chip mini bites! 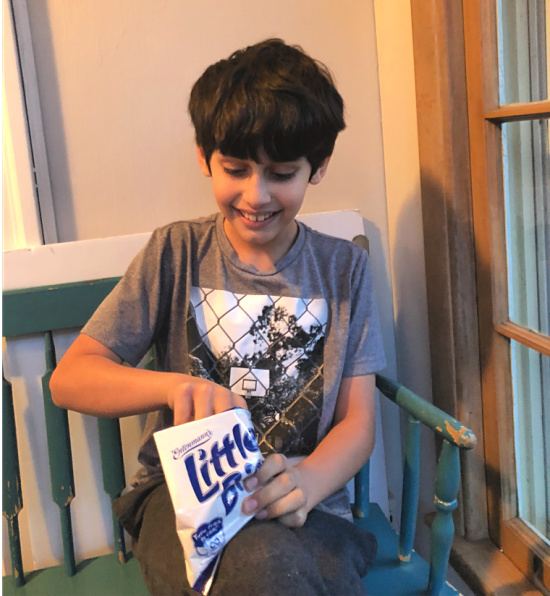 Our kids would snack on Entenmann’s Little Bites after spending the afternoon outside playing in the backyard !!! We would eat them for breakfast with hot chocolate. I would love to snack on Entenmann’s® Little Bites while I am watching movies on the Hallmark channel. During the holiday season, we are busy. Sometimes it is grabbing something on the way out the door as we run errands. Little Bites are the best treats to indulge in while we are out getting things done! We would snack on them as an after school snack or after playing outside in the snow. I like to snack on Entenmann’s Little Bites in the mid afternoon during the holidays whille I am shopping for gifts. My littles would love to try the chocolate chip ones after school! We like to snack on them on the way to afterschool activities. This are great for after school snacks. They make a great mid-morning pick-you-up snack. Before or after school for sure!